I've picked a "Person of the Year" for five years running now - it's not always someone I like (see: Klein, Ralph), and it's not always someone who had a very good year (see: Dion, Stephane). Rather, I like to pick someone who left their mark on Canadian politics over the past 12 months. And as a rule of thumb, unlike the Canadian Press award, I try to stay away from the Prime Minister, since that's a bit of a gimme most years. With no federal election in 2009, there's a temptation to look at provincial politics - Dalton McGuinty was a busy boy, bring in the HST, the Green Energy Act, and full-day kindergarten, while fighting off scandal at EHealth. Gordon Campbell was re-elected, then pretty much guaranteed he wouldn't be in 2013. Darrell Dexter became Atlantic Canada's first NDP Premier. Federally, the rise and fall of Michael Ignatieff got a lot of ink. As did Nanny-gate, Wafer-gate, RAIT-gate, and a slew of other stories that made us all question why it's really worth wasting time on Canadian politics that could be better spent doing something more productive...like, say, watching reality TV. Given how Stephen Harper rules his caucus, it's always a risk to give a Cabinet Minister credit for dressing himself, never mind making major policy decisions. But in a year dominated by talk of the economy, the Finance Minister was the face of several important decisions. First and foremost was January's budget which ensured the survival of the Harper government and ended the coalition threat once and for all (or at least until the CPC attack ads hit the air next election). But the price was high - Canada's first deficit budget in 12 years, which had fiscal Conservatives pulling out their hair and wondering how the offspring of the Reform Party could become the biggest spending government in Canadian history. The projected size of the deficit also had a bad habit of increasing by several billion dollars every month. The budget's stimulus program led to accusations of pork barrel politics and several studies showed that money was being disproportionately spent in Tory ridings. The opposition parties pounced on this, determined to make it as clear as possible to voters that the best way to get what your riding needed was by voting Conservative. It never turned out to be the game-changer they hoped it would be. However it was Flaherty's 2008 budget which may have had the biggest impact on the political landscape in 2009. In was in that budget that he pushed hard for the provinces to harmonize their PSTs with the GST and, one year later, a pair of Premiers took him up on his offer. The end result may be the eventual defeat of two of Canada's longest-serving Premiers but, if economists are to be believed, it will also be a godsend for business in two of Canada's largest provinces. And, while less headline-grabbing, Flaherty's push for a National Securities Regulator represents a real policy decision with meat and bones on it. It's also one of the few decisions the Harper government has made that hasn't been driven by Patrick Muttart's micro-targeted polling numbers. 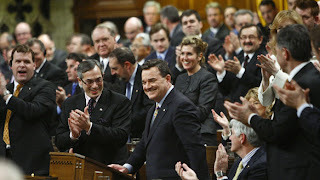 Love him or hate him, Jim Flaherty is turning into one of the most memorable Finance Ministers in Canadian history. Hell, one somewhat misguided magazine named him the Finance Minister of the Year (no, it wasn't the Onion). So, in an otherwise banal year in politics, Flaherty gets another title, this time as my 2009 Person of the Year. posted by calgarygrit at 6:50 p.m. Miserable leprechaun of the year maybe. Interesting that you named Ignatieff in 2006. Perhaps his time has come .... and gone. By jad, at 8:15 p.m. When are you going to announce the 2009 Woman of the Year, Dan? By Elaine, at 8:18 p.m. Both the HST and the national securities regulator are carry-overs from the previous Liberal government. Jimbo the Shorter has, however, shown more conviction on these two files. By Mark H, at 8:58 p.m.
Like you, I wonder if all that makes Flaherty the Person of the Year, or if it is it more accurate to say that he was just a public face of Harper's economic policies. If that is the case, then maybe Harper should be the Person of the Year. I'm sort of inclined towards that belief. If you gave these out monthly, Colvin would have to be December's winner, eh? By rob, at 9:36 p.m.
Elaine - It's a person of the year...a man of the year if it happens to be a man, and a woman of the year if it happens to be a woman (as in 2005). By calgarygrit, at 9:27 a.m.
By Lee Harding, at 11:47 a.m.
Is it just me or has Donolo managed to spike publication of polling numbers while the Liberals are in the sub-basement? Apparently he's banned Iggy from talking with people (and nobody seems quite sure how his angry rant last week was allowed to happen). Is Iggy okay in his hiding place? Congrats to Flaherty for showing the fortitude necessary to the task! By paul.obeda@, at 1:28 p.m. It's interesting that when Candadians want to reference something satirical they turn to an American publication like the Onion. I think that needs to end. Canadians are hilarious, seriously. By Verna, at 1:39 p.m.
We should pan Irish Canadians from participating in democracy. When I think of Ireland, I think of peasants dressed in tartan-free kilts playing worbly folk music. Drunken bastards bashing each other's brains out. We need some real blue blood running this country! Stop the Irish! Stop the Death Squads! Stop Harper! By Non-Irish People for Ignatieff, at 2:58 p.m.
By Cam, at 11:00 a.m.
By Data recovery software, at 2:32 a.m.
By гид в барселоне, at 3:00 p.m. The meeting in the southern Turkish province of Hatay was the first between SNC head Burhan Ghalioun and FSA chief Riyad al-Asaad since their respective organisations were formed earlier this year. The SNC's Khaled Khoja said leaders "agreed that it would be a co-ordinated movement", AFP reports. By tung, at 11:33 a.m.
By Loran Fabyuel, at 12:32 p.m.
By Anonymous, at 9:34 p.m.
By P L A T O R, at 2:38 p.m.